In honor of this year’s 20th edition of the Business Directory, SANEC organized the Members in Business Reception together with Deloitte on the 25th of November at The Edge in Amsterdam. The reception had offered our members the opportunity to (re)acquaint themselves with the southern African business community. SANEC wishes to thank all participants for attending and we hope everybody was able to make beneficial connections. We would be happy to assist our members with follow-up sessions, so do not hesitate to contact us! We would like to show our special gratitude to Deloitte for the wonderful hospitality and the exceptional location at The Edge on the 14th floor with a beautiful view of Amsterdam. We would also like to show our gratitude and thank BOS Ice Tea for their delightful ice tea and Rooibos tea; SPACE, the latest South African start-up company in the Netherlands, for their contribution to the goody bag and their insightful presentation by Mr. Patrick Joore, the managing director, on their business activities, and the Wildlife Justice Commission for their support and sharing their brochure with us. 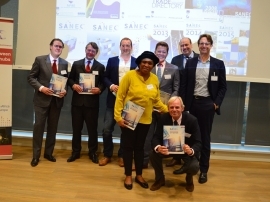 The Members in Business Reception started at 15h00 with a drink and a bite and was officially opened an hour later with a short introduction by Mr. Mark Agterdenbosch, General Manager of SANEC, on the 20 years history of SANEC Business Directories. The programme was followed by a short presentation on The Edge building, the greenest building in the world, by Mr. Frank Bracht, Partner; Transfer Pricing International Tax at Deloitte. Then a brief presentation by Mr. Cees van der Burg, CEO of Buhold Industries and Board-member of SANEC was given, in which he elaborated on his years of business relationships, success and awards through SANEC and how he is now the only manufacturer of tank containers in South Africa, a great achievement indeed. The reception highlighted the new members that were present with short presentations and videos displaying their business activities. Afterwards, our new 20th Edtion Business Directory was officially handed over to the present Board of Directors. The reception had ended with drinks and a bite, giving everybody a chance of networking and building sustainable business relationships.